As a young teenager, I had a ‘record player’ and a 45rpm record of One Bad Apple. Remember the lyrics? One bad apple don’t spoil the whole bunch…. (The Osmonds). One of the great things about fall is that apples are finally in season. You’re able to get apples that are fresh, not apples that were grown the prior year. But autumn is when you can get the freshest apples possible, whether you’re getting them from a local ‘pick your own’ orchard, a farm stand, the farmer’s market or the grocer. There are even some great deals to be found. Once you find a great bargain on fresh fall apples you need to eat them, cook with them or preserve or store them in some form or fashion. Before putting your apples in long term storage be sure to give them a good once-over. Look for apples with rotting spots and bruises. You can use those apples for a fresh pie (cut around the bad spots) or for making applesauce. For long term storage you want fresh, firm apples with no bad spots, bruises, nicks, cuts or over-ripeness. Sort your apples by variety as well as by size. Those bigger apples will go bad faster than the smaller ones AND different kinds of apples have(as some varieties are better for baking… some for eating straight….) different shelf lives. Thick skinned and tart apples tend to have the longer storage lives. Take a hint from the past. Don’t store in plastic containers. Pick some wooden or woven baskets, crates or boxes that will allow some air movement. Apples do gas off and allowing that gas to escape will prolong the usable life of the apples. Those crates should then be stored in a dark cool spot. (Remember Grandma’s cellar? That’s where she kept her apples.) Do you have a basement? A basement will work just as well as a cellar. No basement or cellar? Consider a spot in the pantry as that location is probably dark (when the light is off) and while not necessarily cool will at least be temperature controlled. Don’t store the apples ‘with’ your potatoes or onions (due to the off-gassing). 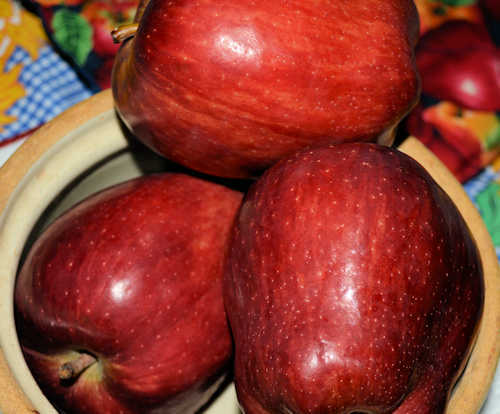 You can always have a few apples out on the counter to encourage ‘apples for snacks’ and even a few in the crisper. If you’re storing large amounts of apples be sure to check them from time to time to remove that ‘one bad apple’ so that it doesn’t ‘spoil the whole bunch’.